Rome, Venice, Milan, Pisa, and Florence are without a doubt some of the most admirable cities in the world, attracting millions of tourists from all around the world. Yet there's so much more to Italy than that, with petite cities and historic treasures to discover just about around any corner. Here's an overview of the less-traveled parts of Italy and 5 off the beaten path regions which would definitely add some spice to your fabulous vacation in Italy. Who should visit? 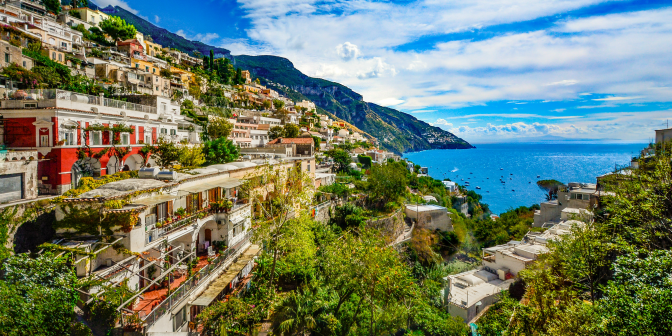 Amalfi is one of the most stunning coastal towns in Italy and is especially noted by admirers of nature and those who love to take long walks. Situated at the mouth of the Valle dei Mulini, Amalfi enchants its visitors from the first sight with its craggy cliffs and shiny bays, iridescent colored sea, mountains and white colored buildings. Amalfi is an exceptionally beautiful and harmonious place, no wonder Renato Fucini, a renown Italian writer, once said that when the inhabitants of Amalfi go to heaven for them it is just like any other day. When in Amalfi it is a must to visit the serenely beautiful Paestum archaeological site, which is world-famous for its Greek temples that are in an amazing state of preservation. It's off the tourist path so you will have a chance to peacefully wander along the roads, visit the amphitheater and thoroughly explore the sites. Amalfi is gifted with multiple panoramic footpaths, so all hiking enthusiasts should put this destination on their bucket list: Il Sentiero degli Dei (7,8 km), La Baia di Ieranto (6 km), Punta Campanella (4 km), Il Santuario dell'Avvocata (16 km), La Torre dello Ziro (5 km), Il Vallone delle Ferriere (6 km) are just a few spectacular trails that await in Amalfi. How to combine? This destination is included in our popular Italy small group tour and could be also added as an extension for other tours to Italy. For those who're travelling on their own, we suggest adding this destination when visiting Pompeii, Naples, Rome. Who should visit? If your top priority is to emerge in history and see ancient ruins, go to Bari. The city is full of religious architecture like the Basilica di San Nicola, ancient architecture in Alberobello located on 2 hills (rated high by our travelers), Borgo Murattiano, a district with a variety of architecture. Though Bari is not a major tourist destination, it has plenty of lively bars and restaurants to enjoy delicious local cuisine which includes good quality seafood, colorful vegetables, pasta, pizza, focaccia and much more. If you have the chance to spend a few extra days in Bari, we advise to explore its surrounding cities: visit a sea harbor in Trani or, for a special feeling, go to Ostuni, where the entire town is painted in white. We suggest you go to Bari from May to June when the chances of rain are slight and the weather is sunny and warm, the weather becomes cooler and wet from November to February. How to combine? This destination is included in our private tours to Italy and could be also added as an extension for other Italy tours. If you make the travel arrangements yourself, we recommend adding this destination when visiting Naples and Rome, it is also very convenient to take a ferry to/from Croatia or Greece and make it a nice extension. Who should visit? Sicily is another off-the-beaten-path destination boasting spectacular gems, from Italian fishing villages to historic architecture and scenic nature. This is a unique Italian island to which travelers come to for an authentic feel, as Sicily is like a museum, a uniquely preserved place where tourism has not taken hold yet. This island, placed in the very heart of the Mediterranean, is full of wonders: picturesque mountains, numerous beaches for nature lovers, local food and wine for foodies, stunning hiking paths and volcanos for all adventurous souls. Of course, the volcanic caves of Etna, the highest active volcano in Europe, is one of the main wonders people are seeking to discover in Sicily. We suggest visiting Sicily from April to May and from September to October, otherwise, prepare to get warm. How to combine? This destination is included in our private tours to Italy and could be also added as an extension for other italian programs. When going independently we advise adding this destination at the beginning of your trip and after that visit Rome, Milan, Pisa. Also, you would get a nice combination adding Palermo, Erice, Agrigento and Taormina to your tour. Who should visit? Those who want to try authentic wine tasting, learn how wine is produced and its history, enjoy stunning surroundings of the rolling hills, historic architecture and art, should visit southern Tuscany and two of its hill towns at least once in a lifetime. Both the charming small city Montalcino and a slightly bigger one, Montepulciano, have fantastic wines, a great selection of splendid restaurants and equally world-famous vineyards, wines that have proud centuries-old history and a beautiful countryside. Montepulciano is famous for Vino Nobile di Montepulciano and Rosso di Montepulciano while Montalcino's famous wine is called Brunello di Montalcino. Montalcino is a small medieval town situated on top of hill, covered with famous vineyards and is perfect for recreation, while Montepulciano is more vibrant Renaissance hill town which, from an architectural point of view, has more things to discover: Renaissance buildings and churches. We suggest to visit one of the cities or even combine both destinations. How to combine? This destination is included in our private Tuscany gastronomic tour and could be also added as an extension for other Italy tours. If you're planning a trip on your own, we would suggest including this destination when traveling to Florence and Siena. Who should visit? Some may argue that Cinque Terre is far from being an unbeaten path since it is a famous tourist destination. This statement is partly true, the cities are rarely empty, nevertheless, this destination is heaven for hikers that could enjoy vast and unoccupied hills and widths. That's why if you're longing for spectacular scenery, natural untouched beauty, and unique hiking paths, Cinque Terre is a must. This charming seaside village is formed by 5 individual villages (Monterosso, Vernazza, Corniglia, Manarola and Riomaggiore) and each is well preserved and has been considered a UNESCO World Heritage Site since 1997. Surprisingly, only a few places are accessible by car, most of the time people reach these villages by ferry, walking paths, and trains. This is the main reason why the nature there is untouched and the region is full of religious and antique heritage. Both, hiking enthusiasts and beginners are lured to Cinque Terre to hike, since routes there cater to all levels, from easy 20 - 60 minute strolls to challenging tracking up the steep hillsides. The climate of Cinque Terre is sunny and warm, during the winter season the average temperature is around 12 degrees Celcius while in summer it may reach 30 degrees Celcius. We suggest visiting it from March to the end of October, this is the best time to have not only hikes but also peaceful mornings to enjoy Ligurian cuisine and coastal scenery, dating from the early medieval period. How to combine? This destination is included in our private tours to Italy and could be also added as an extension for other Italian tours. When going independently we recommend adding this destination when visiting Florence, Milan, Pisa, Venice. All in all, a trip to Italy is something to remember your whole life. The country is very diverse and rich in architecture, natural beauty, culture, and cuisine. Is Italy on your list?